FREE Betty Crocker Cake Mix At Price Chopper! 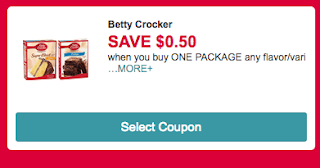 $0.50/1 Betty Crocker Cake Mix or Frosting - these are on sale for $1 thru Dec. at Price Chopper = FREE! Frosting is $0.50 after coupon.